Viva La Virgen!Viva El Divino Rostro!Viva Our Lady of Peñafrancia! 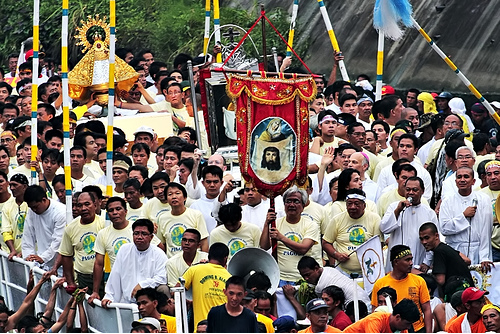 The Peñafrancia Festival is a grand reunion of all Marian devotees from all over the country. Philippines, a Catholic country, is becoming one of the religious tourist destinations. You can walk into the churchyard and feel the rich Spanish influence in the ancient Catholic churches and priceless religious relics. If you are a bonafide Marian devotee and a Bicolano (a person from the Bicol region), the annual highlight of your devotion will surely be the Peñafrancia Festival of Naga City in September. Every year, the whole of Bicol go to Naga to partake of the religious holiday, the biggest Marian banquet of the state. It’s also considered one of the first holidays in September mixing faith, culture and custom in a 9-day range of activities. The festivities include civic and army parades, sports holidays, carnivals and exhibitions, regattas, cultural events, beauty festivals, and other dynamic competition. The holiday is the Bicolanos devotion to the Our Lady of Peñafrancia, whom Bicolanos fondly call “Ina” (mother). The holiday climaxes as the image is escorted along the Bicol River, where a raft or pagoda of the Holy Image is placed. Beside the pagoda are canoes and other rafts of bamboo and decorated motor boats. Before the night finally envelopes the area, candles are lit as jewel-like flickers in the darkness. Throughout the procession, devotees echo the cries of “Viva la Virgen” and “Viva El Divino Rostro” for the Holy Photographs. The weight of the image is moved through the help of male devotees or “voyadores” and they walk on the pavement, shoeless and with colored banners on their heads or arms. On the side of the streets and river, steadfast they say the novenas and pray the rosary. As people walk in a gulf of faces under the scorching heat of the afternoon or the downpour of the rain, which is very likely in the month of September, everyone seems to forget their discomfort as they’re crushed by other pilgrims. All these excitement and pious veneration is given to the Mother of God, and Her Son Jesus. Witness other religious holidays and Philippine festivals like the Sinulog Festival in Cebu and Panagbenga in Baguio.